On March 20th five Fellow Craft were raised to the Sublime Degree of Master Mason; they are: Bro. Brian Cunning, Bro. Anthony Fella, Bro. Ernest Perez, Bro. Ben Razinovsky, Bro. Jose Trinidad. Congratulations to our newly raised brothers! We were assisted by the brothers of West Point Lodge #877 lead by R...W... Mark Hansen and W...Rossano of Croton Lodge #368 who gave a Broadway level performance of the Hiramic Drama. Our degree team with V...W... Raphael Wong in the East gave us a flawless performance for the evening. A big thank you to everyone for their efforts! It is my great pleasure and honor to congratulate and welcome our newly made Master Mason to our fraternity. The Annual Grand Lecturer’s convention for district 2 scheduled at our Lodge on March 6 was combined with district 1 and was held at the Tarry Town Masonic Lodge on March 14. The Grand Lecturer of Masons of the State of New York held an enlightening event concluding with the demonstration of the new Hiramic Drama which will be voted on at the May Grand Lodge Communication. For the month of April, we will have a Stated Communication on April 3rd when we will conclude the Master Mason degree with the Historical Lecture, Q&A and Instructions to our new Master Masons. The Fellow Craft degree scheduled for April 17th will be postponed until the fall. The Stated meeting will feature a participative discussion on the meaning of the EA degree obligation. Instructions on how to prepare for the meeting will be communicated via email in early April. Looking ahead to the remaining year activities we will have the EA degree for 5 candidates on May 1st The election and installation of officers for 2019/2020 will be done on the same night on May 15th. It will be a public event with masonic families invited to attend. Various awards will also be presented. Finally, on June 6th we will hold the annual “Parking Lot BBQ”. Prospective members and spouses or significant others are invited to attend. As always, RSVPs for both the Installation of officers and the BBQ will be required. The annual Second Westchester-Putnam District Dinner Dance will be held on April 13 at Tesoro D’Italia160 Marble Ave, Pleasantville. Please plan to attend with your significant other. If you are planning to attend and would like to sit at the White Plains Lodge table, send your check in the amount of $ 100/person payable to White Plains Lodge and mail to Box 1842 White Plains N.Y. 10602. The Grand Lodge of the State of New York, 71 East 23rd Street New York, is holding its annual communication on May 6th and 7th 2019. If interested to attend, please contact the Secretary for more information. April birthdays to be celebrated on April 3rd. If your birthday is in April and your name is not included below pleased drop me a note. We are now in the second half of our masonic year and looking ahead at our calendar we need to make some adjustments, primarily to accommodate performing degrees. We are cancelling the Table lodge planned for April 3rd and replacing it with a stated communication for doing the second part of the MM Degree. We are also changing the meeting on May 1st to a degree night when we will have the EA degree for 5 candidates. The installation of officers for 2019/2020 will be done on the same night as the election of officers May 15. Finally, the June 6th Communication meeting will be changed to the annual “Parking Lot BBQ” and Awards night. Prospective members and spouses are invited. The month of March is promising to be busy. For the March 6th meeting we are hosting the Annual Grand Lecturer’s convention for our district. Only Master Masons are invited to attend because the program includes parts of the Third-Degree ritual. Collation at 6 pm. Convention at 8pm. Entered Apprentices and Fellow Crafts are welcome to join the collation and dinner. It will be a great night to meet and greet brothers from other lodges of the district. There are a few District/Grand Lodge wide events coming up that I would like to draw your attention to:First, the MAGLA Ritual Contest, is scheduled for March 28, 2019, 7:30 pm at the Grand Lodge of New York, 71 East 23rd Street New York. The work for the competition is the Working Tools from all three Degrees and it is open to Master Masons. Contact the officers for more information. Second, we have the annual Second Westchester-Putnam District Dinner Dance on April 18 at Tesoro D’Italia160 Marble Ave, Pleasantville. Please plan to attend with your significant other. Please talk to any of the officers if interested and watch for a separate announcement. February and March birthdays to be celebrated March 6 at collation. If your birthday is in February or March and your name is not includ-ed pleased drop me a note. Our masonic year is well under way having reached the midpoint. The new year is also here, promising to be even more exciting than the last. The first meeting of the year was January 16 and we held an Entered Apprentice degree with eight candidates initiated. 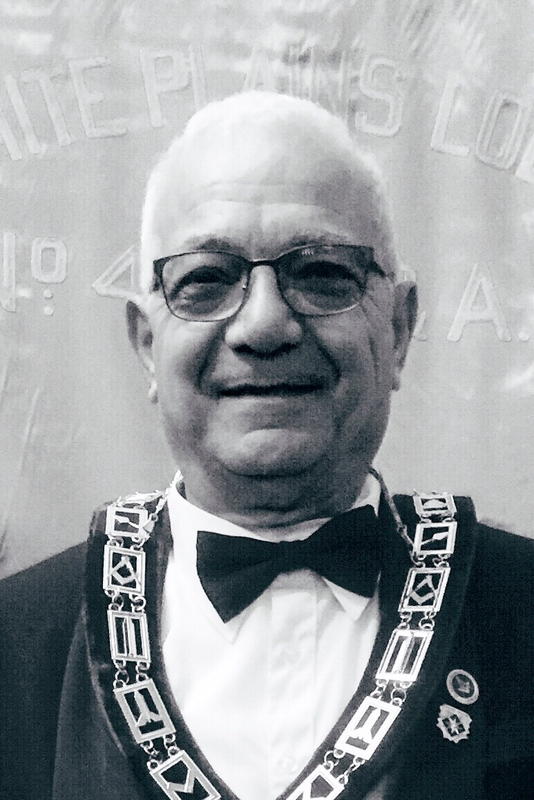 Junior Warden Bro Andrew Lovato was the Master for the evening and the event was attended by the District Deputy Grand Master R...W Michael Grenadier, the Grand Sword Bearer R...W William Kindle and the Assistant Grand Lecturer V...W... Raphael Wong. A big thank you to all the Brothers who participated in the degree and to those who attended. The new Brothers are: Bro. Paul Alcin, Bro. John Bodur, Bro. Folorunsho Davidson, Bro. Nicholas Ferrandino, Bro. Xavier Garcia, Bro. Jacob Meranda, Bro. Manuel Patalinjug, Bro. Terrance Roys. The upcoming February 6, Stated Communication meeting will feature a Lecture by VW Raphael Wong, Assistant Grand Lecturer. The February 20 meeting will be a public one and has been designated as the annual Ladies and Widows Night. Reservation will be absolutely needed, and a separate announcement will follow. Lodge Brethren to attend the convention which will feature various announcements and lectures. The March 20th meeting will be a Stated Communications meeting. Saturday March 23 will be a special Master Mason’s degree meeting. Planning, preparation and rehearsals will be announced in early February. February Birthdays will be celebrated at the Feb 20th meeting. topics concerning Freemasonry and it was well received by the brothers present. Looking ahead to the first few months of the year we do have a busy schedule! For January we have the stated communication meeting on the 16th which will be the occasion for conferring the Entered Apprentice degree on eight candidates who have been accepted for membership. Preparation and rehearsals for the degree are under way, scheduled on Saturdays January 5 and 12 from 9 am to 11 am. We have all the roles filled for the degree, but we do need commitments for eight conductors. If you can commit to be a conductor, please let the Master or the Senior or Junior Warden know. The February 6, Stated Communication meeting will feature a Lecture by V...W... Raphael Wong, Assistant Grand Lecturer. The February 20th Meeting will be a public one and will be our annual Ladies and Widows Night. Reservation will be absolutely needed, and a separate announcement will follow. Our lodge has been chosen by the district to be the venue for the Grand Lecturer’s Convention on March 6th. This is in lieu of our regular meeting. All officers in the district are required by Grand Lodge to attend. We believe that we will have a full lodge that evening as many brothers from the district will be attending. We need to organize ourselves accordingly for this event which will include a dinner and full bar. An organizing committee for the event will be announced under the auspices of the Grand Lecturer’s office to ensure all issues are addressed appropriately. Saturday March 23 will be a special Master Mason’s degree meeting. Planning, preparation and rehearsals will be announced in early February. January Birthdays will be celebrated at the January 16th meeting. A cordial and fraternal invitation is extended to you and your Masonic friends to attend the listed communications of White Plains Lodge No. 473 F. & A.M., for the transaction of such business as may regularly and constitutionally be brought before it. On Oct 17th we hosted the District Deputy Grand Master R...W... Michael D Grenadier on his official visit to our lodge. Accompanying the DDGM were the Grand Sword Bearer R...W... William Keindl and the Assistant Grand Lecturer V...W... Raphael Wong. present. We have the Fellow Craft degree scheduled for Nov 7, and preparations and rehearsals are under way. Conductors for the four candidates will be assigned at the night of the degree. Please volunteer. Preparations are also under way for the two Entered Apprentice degrees scheduled for December 5 and 19. Rehearsals will start after the completion of the FC degree in November. The Thanksgiving dinner is scheduled at the lodge for Wednesday Nov 21st Please contact Bro Junior Warden Andrew Lovato. The Christmas luncheon is scheduled for Sunday Dec 9th 2:00 PM at Casaletto Ristotante Elmsford, N.Y. Family and friends are invited. The cost per person is $ 65.00 which includes hot and cold appetizers, pasts a choice of three entree’s, dessert and coffee, beer and wine. (Cash bar for mixed drinks). Please send your RSVP check payable to White Plains Lodge and mail to Box 1842 White Plains, NY 10602. Salvation Army bell ringing scheduled for Saturday Dec 15. Please Contact R...W...Jim Holden to sign up for your preferred hourly time slot. The ceremony of Apron Presentations to District Officers, when V...W...Raphael Wong will be presented with his Apron as Assistant Grand Lecturer. The event will be held at the Tarrytown Masonic Temple, 54 Main street on Monday November 5. Dinner at 6:30 pm and ceremony at 8 pm. Please reserve by email to: R...W...Michael Grenadier. Birthdays of November will be celebrated at the Nov 21st meeting. Our September 19th Stated Communication Meeting marked the beginning of the new Masonic Year, and I am happy to say that we hit the ground running. Looking ahead for the next three months, we have a busy schedule, starting with the District Deputy Grand Master’s official visit to our Lodge on October 17. We have a Fellow Craft degree scheduled for Nov 7, followed by two Entered Apprentice degrees Dec 5 and Dec 19. We would like to see every brother participate in these degrees as conductors or delivering some part of the degree. Please contact Senior Warden Peter Genovese for the FC degree and our Junior Warden Andrew Lovato for the EA degree. The Thanksgiving dinner is scheduled at the lodge for Wednesday Nov 21st and the Christmas dinner is scheduled at a restaurant (to be announced) for Dec 9th. Family and friends are invited. Please contact Junior Warden Andrew Lovato and Bro Secretary Vincent Cunzio respectively. On Oct 20th, our esteemed R...W... Grand Organist Frank Miller will conduct a recital hosted by our lodge at the White Plains Masonic Temple. The event is open to the public. Plan to attend. Donations are encouraged; proceeds will be allocated for the upkeep of Temple building. Our Lodge participates in the Salvation Army bell ringing, in the city of White Plains, in support of charity. This year the event will be held on Dec 22 and we would like to encourage our brothers to sign up for hourly time slots with R...W.. James Holden. Collation dinners will be free this year. This makes your RSVP crucial for our planning. We recognize that the collation dinner is a great way to socialize and be in communion with each other and we encourage all to participate. Brothers who would like to demonstrate their cooking abilities are encouraged to contact Bro Junior Warden Andrew Lovato and sign up for preparing and serving the meal in an upcoming collation. An award and recognition will be given to the chef judged to have prepared the “Best Meal” of the year. Birthdays will also be celebrated at the meeting of the third Wednesday each month, after lodge closing. Make sure you do not miss your own birthday celebration.